Have you tried IBM Toners ? For those who have been using High Quality Genuine HP Printer Toner for the daily printing need, the cost of printing has increased many folds throughout the last few years where price of toner has been increasing annually by a few percentage point. Some toners such Q2612A (12A) which cost less than RM 200 at one time is now cost almost RM 300 each unit. With 50% increase in toner price, printing is becoming very expensive if you continue to rely on Original HP Toners. 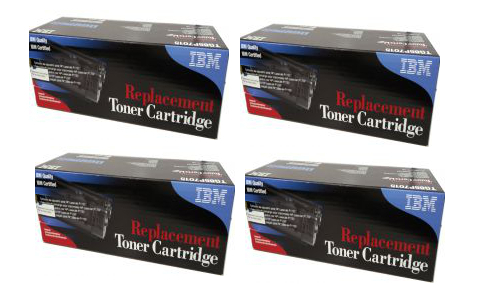 There is now IBM Replacement Toners available for most of the popular HP Models. The quality of the IBM Toners are close to that of the Original HP Toners and yet is 20% to 25% cheaper. Many users of the Original HP Colour Toners are generally need high quality colour printing and this can also be similarly achieve with the use of IBM Replacement Toners for HP Printers. Users that own HP models such as Laserjet 5550 who have been using IBM C9730A Toners , C9731A , C9732A and C9733A Toners found that printing result are equally good when compared to HP Toners and they have since continue to use IBM Toners instead of HP Toners, thus enjoying saving in printing cost. Some of the popular Models of IBM Toners which are popular are HP colour models such 124A, 125A, 126A, 128A, 130A, 131A, 304A, 305A, 645A, 507A. Mono Lasers Models such as CF226A, Q5942A, Q5942X are offer substantial saving. If you are using HP Printers such as M177FW, CP1025, CP1025nw, M176n, 5550, 2600n and many more, pick up your phone can call us today at 019-3256289 to get a quote or proceed to view the prices of IBM Toners online. Feel free to Contact Us if you need more information about IBM Toners.